In the 1980s a local newsagent used to give me his trade magazines after he'd read them. 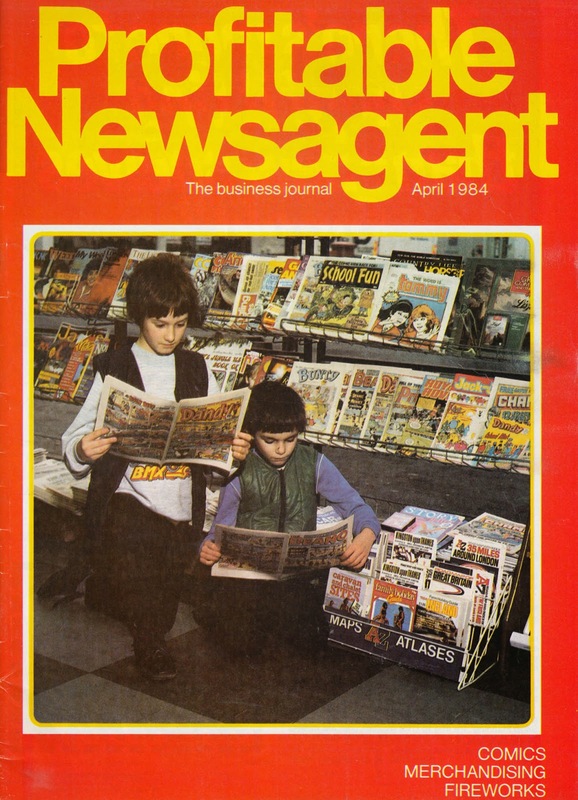 One such publication was this issue of Profitable Newsagent from April 1984 which featured a four page article on the state of British comics at the time. 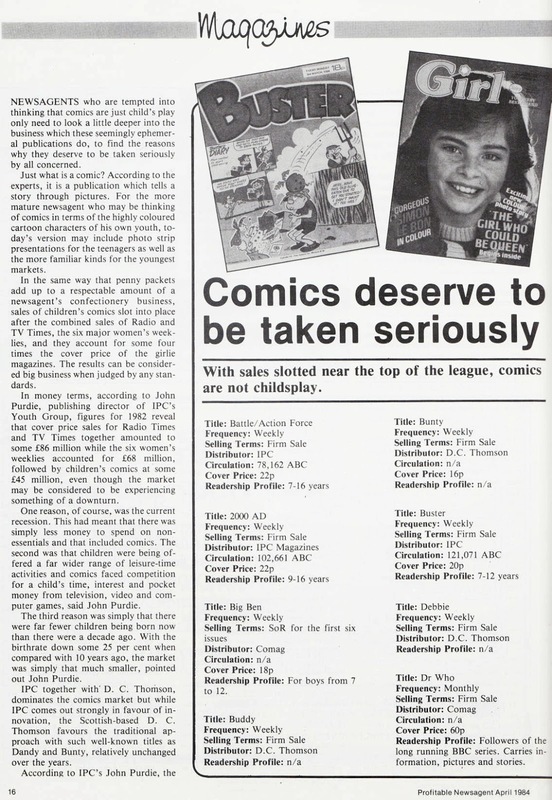 As you'll see when you read the item, the feeling was that, although sales were declining, comics were still a healthy investment for newsagents. 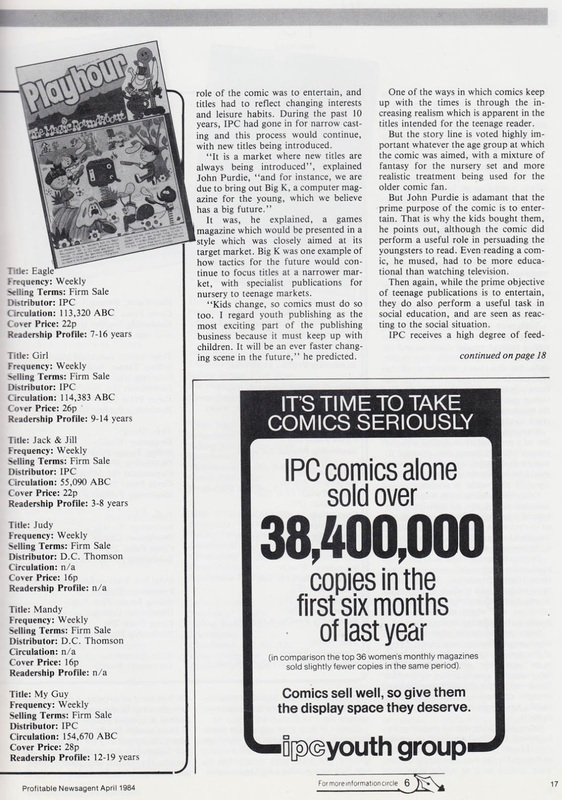 Apparently combined sales figures for comics in 1982 were £45 million. 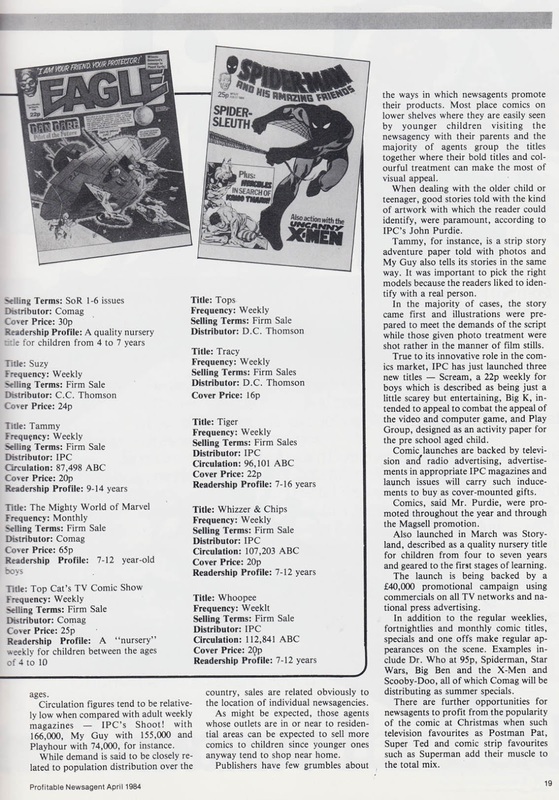 The article makes an interesting observation about content: "Very often, adults were swayed by a nostalgic appeal and a reminder of the type of comic which they themselves used to read when they were young. But unless it also appealed to the child who would receive it, future sales would be lost". That remains true to this day, which is why pandering solely to nostalgia serves no purpose if it fails to excite the intended audience. Comics must reflect modern tastes, but at the same time appeal to the parents who purchase them. It's never been a simple task to balance the two but it's what has to be done. As for displays back then, comics were usually on wire racks, as can be seen from the photo above. "Most place comics on lower shelves where they are easily seen by younger children" informs the article. Sadly, a practice not always followed today, with some news chains bizarrely putting comics well out of the eye level (and reach) of their intended audience! The circulation figures of 30 years ago are far healthier than those of today, although it should be noted that the average 1984 figure of 100,000 a week was easily half the figure of 30 years previously. Comic sales have been dropping steadily for decades, as each generation becomes more preoccupied with other distractions. Click on each page to see it larger (and you may need to click on it again to see it even bigger). These are great love the photo cover...as you say mixed with sadness..
Whoopee was selling more than Whizzer and chipsso why on earth did it merge? I loved Whoopee and it was a huge shame that folded. What I find strange is how certain comics only appear in certain shops, those Panini Marvels only seem to be sold by WH Smith's. Other shops do stock them (my corner newsagent for one) but not many. It might be that Smiths are their distributor, so only shops Smiths supply can have them. 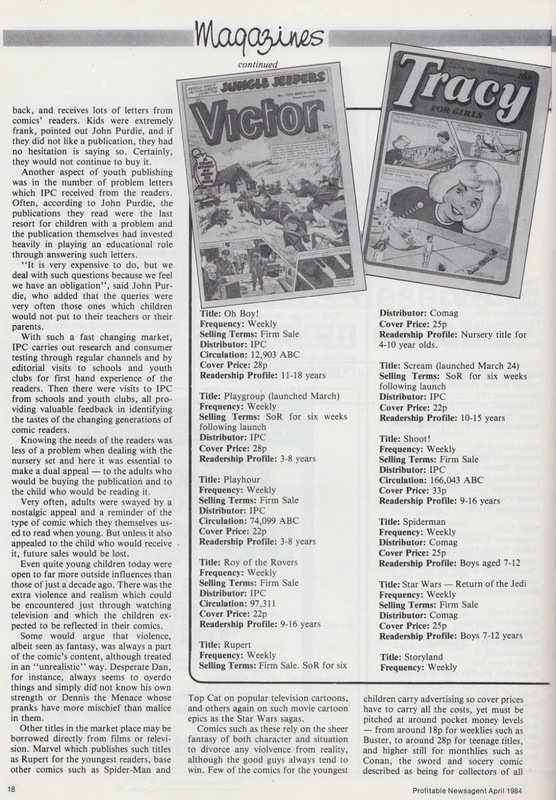 Peter, sometimes when two comics had falling sales, IPC would merge the younger title into the older one, even if it was selling a bit better. Whizzer and Chips was the humour division's flagship title so I guess Bob Paynter (group editor) wanted to keep his baby going as long as possible. Really fascinating. I started reading Buster and Whizzer & Chips in 1984 - how did their circulation compare with Dandy and Beano I wonder? I think Dandy and Beano always sold better than their IPC rivals, but DCT didn't declare circulation figures in those days. In our shop, we've recently moved all the kids magazines (I won't call them comics, because they aren't - they're cheap toys with paper attached) up to the top shelves based on the requests of customers. Parents come in to buy some bits, kids grab toys/papers from the shelves and bug the parents for them, then cause a big fuss and noise when they're refused. Now that they're on the top shelves, the kids ask the parents (or us) to get them down for them. This is generally the indicator of a good, well-mannered kid, who's rewarded with a toy/paper after the parent's had a quick inspection of it. We've actually sold more of the things this week than we did through all of January! Interesting. Isn't January usually a quiet month though? Fair point about kids grabbing comics and having tantrums. I'd forgotten that some behave like obnoxious brats if they can't have what they want. Very sad indeed. I was of that comic-buying generation (I was 8 in 1984), and was a reader of School Fun and Champ. Probably one of the very few judging by how long those titles lasted. While I do personally feel that today's kids are missing out by not being regular comics readers, I'm sure my parents felt much the same about things that they had in their 60s childhood that we 80s kids didn't have. Just as I'm equally sure anyone under 18 today will regard me as an old man because I remember 3-channel TV. Comics are pretty much dead today as mass medium, sadly. Good point about the attitudes of each generation. I was in my twenties throughout the 1980s and felt that the 1960s were better, particularly regarding comics. But everyone feels that way about their childhood as you said. Looking back now, the 80s had a feast of UK comics compared to today. I'm sure comics will always be around in some form because it's such a brilliant way to tell a story. Kids love them IF they get chance to see them, (many kids will sadly grow up never having a comic) but the habit of actually buying a comic every week has been declining for decades. It's a great point about "comics" being bagged up nowadays. How are kids to be enticed if they can't flick through them? I bought something (can't remember which one exactly, possibly a one-off Hallow'een special) for my nephew a few months ago and, as is generally expected now, he ripped open the bag, took the spider toy out and didn't open the magazine. Brilliant Lew, the circulation figures are really revealing. Interesting how little difference there is between all the IPC titles, Roy and Tiger having nearly the same figures, but Tiger getting the snip soon after and Roy lasting for many years more. I struck up a conversation with a stranger on the train last week about how the newsagent is still the main place to be introduced to comics and how unfortunate it was that they're almost all bagged so kids can't take a look through. Despite the advent of digital comics, kids don't just stumble on them in the same way as they would in a newsagent. Love to see someone launch a new comic with the excitement of a 2000AD or ACTION again and not bag it. The Phoenix isn't bagged, and has been on sale in WH Smith now for over 100 issues. (It got into Smiths with issue 200.) Striker isn't bagged either, so there is a way to do it. I think it's the supermarkets who prefer bagged comics, although they do take The Beano, which is very rarely bagged these days.